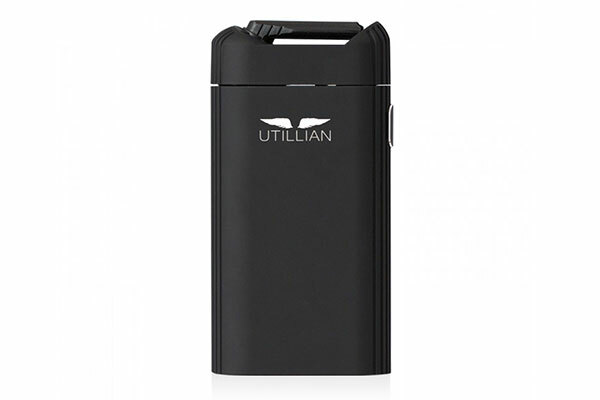 The Utillian 721 vaporizer has evolved to have 15% more battery life while offering same great performance of its predecessor the is the Utillian 720. 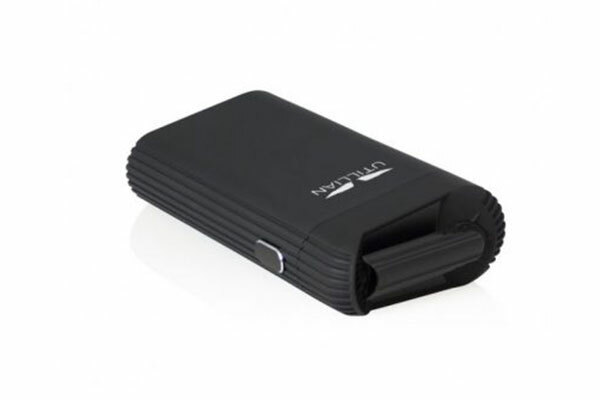 We think the Utillian 721 is a tremendous value as a lower cost, truly convective, herb vaporizer. The 721 features the same simple one-button functionality as other Utillian devices, but allows eight distinct temperature settings to be selected for a great custom session. The Utillian 721 resembles the much more expensive Crafty vaporizer is its looks, but more impressively, in its performance with both loose leaves and waxes. As a convective device (as opposed to conductive systems typically found in devices at this price point), hot air developed under the ample heating chamber is drawn through your botanical or wax to generate a truly impressive vapor density, especially at higher temperatures. The Utillian 721 is as beautiful as it is effective, and the rubberized coating over the aluminum case feels great in your hand. When your session is over, the fold away mouthpiece tucks away, neatly aligned with the magnetic cap. The devices dimensions are a great size at about 4-1/4″ x 2-1/4″ x 1″ to fit easily in a shirt or sweater pocket, a briefcase sleeve. or little handbag. The 721 can’t claim to equal the Crafty by Storz & Bickel in terms of performance, but it gets really. We think the Utillian 721 is a perfect fit for the connoisseur that is looking for a higher level of performance at a great price. In fact, it is a favorite at Rocky Shore. Let’s have a closer look! Utillian 721 is a particularly pleasant and easy device to use. A flip of your thumb releases the magnetically latched lid with no need to unscrew or turn it. The cap can then be held out of the way while you load and very lightly pack your herb in the heating chamber. We like the performance when we just very lightly packed the botanical. This allows the hot air from the heating element to evenly peculate through your precious herb to deliver the best possible vapor and economy. Like many devices, the 721 is turned on and off by pressing the single button 5 within a second or so. Once activated, a translucent indicator on the top of the head lights up to indicate which temperature setting is selected; it will always be whatever setting you were using for your last session. On the bottom of the unit, a small LED light will be either green, yellow or red indicating the approximate level of charge remaining on the battery. When it turns red, you will need to recharge the unit soon. The increase of the battery life of the 721 by 15% was a great improvement over the 720, making last all day for most users. The Utillian 721 has four base temperature settings: Green = 170° Celsius, Blue = 180° Celsius, Purple = 190° Celsius and Red = 210° Celsius. If you click and hold the power button while at any temperature preset, the 721 enters what Utillian calls “enhanced mode,” which increases the temperature by an extra 5 degrees. In effect you actually have 8 temperature settings to choose from. You can use enhanced mode for an entire session, but we found it especially useful towards the end of the session as the extra heat helped to increase the density of the final cloud draws. All we can say it out-freaking-standing. The Utillian 721 truly does compare well to the Crafty by Storz & Bickel. The vapour density isn’t quite as rich or cool, but for the price of the 721 we remain sincerely impressed. We loved the 720, and we love the Utillian 721 even more. The head on the 721 doesn’t have the same cooling capability as the Crafty (because the mouthpiece is directly over the heating chamber as opposed to being offset like the crafty), but the large cross-sectional area of the heating chamber allow the hot air to fully penetrate the herb to produce fantastic results. And we never found the vapour hot with 721, even at the highest temperature setting. The air draw-through is very good, with moderate restriction that allows a great continuous draw. For us, we like the purple light setting (190 degrees) for herb for a slightly warm, but rich vapour. For waxes, we liked it cranked to the highest setting of fast flashing red. The Utillian 721 works great with wax. The Utillian 721 produces a stellar vapor quality by any standard. 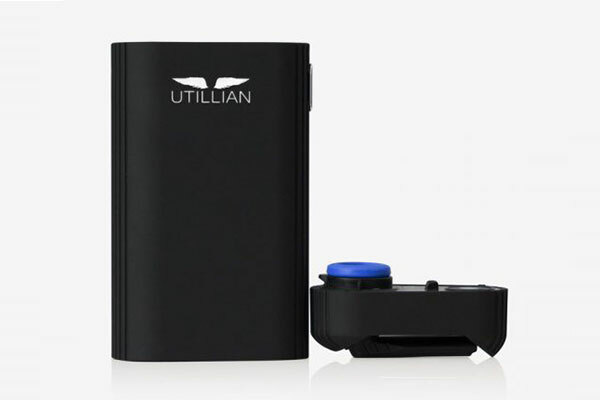 Like all the Utillian products, the Utillian 721 vaporizer is a very well manufactured device that feels substantial in your hand and looks great. Unlike other vaporizers in at a similar price point, the exterior case is a rubberized aluminum instead of cheaper plastic, and the polymer mouthpiece swings out for use and back in line with the head when it’s time to get moving. The mouthpiece is the weak link for the Utillian 721. After using ours (it was the 720 then) for about 8 months, the polymer tabs that hold the mouthpiece in place eventually broke and the mouthpiece had to held in place with your index finger to use the device. The good news is that the 721 comes with two replacement mouthpieces. After a few years, you can just purchase the inexpensive new head and spare mouth pieces. We really like the simplicity of the one-button operation, ease of switching between temperatures and the battery indicator. It is a very intuitive device to use. The Utillian’s 721 is protected by a 1 year manufacturer’s warranty reflecting the company’s confidence in their products. A fully charged battery will last for about an hour, for 5 or 6 sessions. For many people, this more than adequate to last all day, and lighter users may get a few days out of a charge. If you need to do a mid-day charge, it’s easy to find a power source with the micro USB charging cable; USB ports and backup power banks are almost everywhere these days. The Utillian 721 is a great, size and shape, and doesn’t look flashy or have bright lights to draw attention to itself. Sleek and discrete, the 721 is quite inconspicuous. 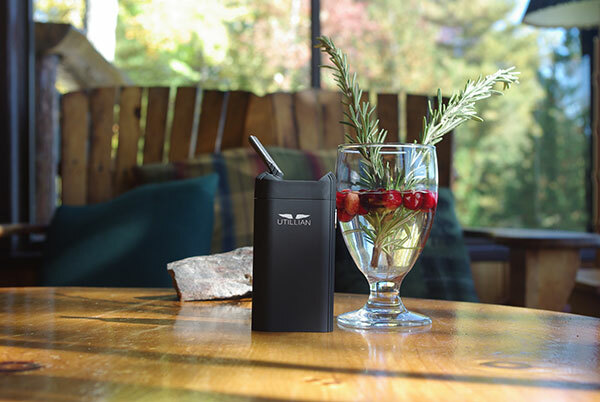 We think that the Utillian 721 is one of the best portable vaporizers on the market, and a great value for our customers. Strong endorsement, we know. But this little unit really kicks it in our opinion. The high quality construction, beautiful design and great price make this vaporizer a winner, and its dimensions, shape and attached mouthpiece make the 721 remarkably portable and convenient. The vapor quality of the Utillian 721 is rivaled only by much more expensive devices, and the 8 temperature settings allow great flexibility for your sessions, so that you get the most from your best herbs and waxes. We think of the 721 as a second generation unit. If you started vaping with a less expensive conductive unit, the 721 takes you to the next level. The 721 really is a hit and a favorite of ours.